A record 25,000 people joined an anti-Islamic march in Dresden on Monday, AFP reported. The Dresden rally, one in a series of weekly marches that have been taking place since October, was organized by anti-immigration group Patriotic Europeans Against the Islamization of the West (PEGIDA). Even before last week’s extremist attack on Charlie Hebdo, anti-Muslim feeling in Germany had been growing. A poll published January 1 revealed 13 percent of Germans were ready to attend an anti-Muslim march nearby, while 29 percent believed that such marches were justified. The poll was done by Forsa for Stern magazine and was based on opinions shared by 1,006 respondents. Ahead of Monday's rallies, German Chancellor Angela Merkel came out against the anti-Muslim protesters during a news conference with Turkish Prime Minister Ahmet Davutoglu, after both participated in a massive march through Paris to honor the victims of the Charlie Hebdo attack. “Former President Wulff said Islam belongs to Germany. That is true. I also hold this opinion," Merkel said. She thus referred to comments made by former German President Christian Wulff in 2010. That same year Merkel famously pronounced the policy of multiculturalism in Germany dead. "And of course, the approach [to build] a multicultural [society] and to live side-by-side and to enjoy each other... has failed, utterly failed," she told young members of the Christian Democratic Union (CDU) at the time. Germany’s Nazi past has been among the reasons for the country’s liberal asylum laws. As a result, the number of asylum seekers has grown fourfold since 2012. PEGIDA is demanding a new immigration law that would see immigrants forced to integrate and that would make sure Islamists going to fight in Syria and Iraq never return to Germany. "We are getting more support each week," PEGIDA co-founder Kathrin Oertel told Reuters. "We are against all violence that is religiously motivated, whether Muslim or Christian ... People have been confronted by it now and are thinking about it more." 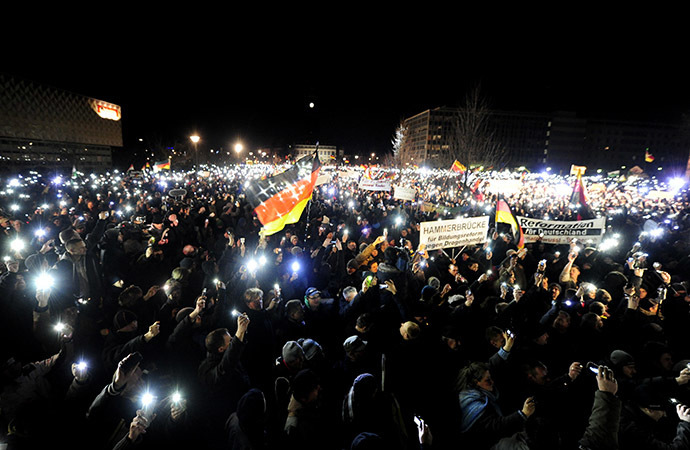 Counter-protests against PEGIDA have also been massive throughout Germany. In some German cities, anti-PEGIDA demonstrators have reportedly outnumbered PEGIDA supporters. German national news agency DPA reported that anti-PEGIDA rallies saw over 8,000 activists assemble in Dresden, 30,000 in Leipzig, 20,000 in Munich, 17,000 in Hanover, 9,000 in Saarbruecken, 5,000 in Duesseldorf, 4,000 each in Berlin and Hamburg, and 2,000 in Rostock. In Dresden, which drew Monday's biggest crowds, PEGIDA activists and their rivals took part in an aggressive verbal exchange as protesters traded lewd hand signals and banged on the security fence set up to prevent scuffles. The rival demonstrators were chased off by police before the situation could escalate further, Ruptly reported.